The newly elected Hodgman government has entered Parliament less than six weeks after the election with an ambitious 100-day plan. The idea is to deliver on election promises of unwinding the forests agreement, payroll tax relief and planning reform. Tuesday, May 6, marked a historic occasion for the Tasmanian Parliament, when it was formally opened by the first Liberal government in 16 years. There were calls from the Tasmanian business community to get on with the job. Premier Will Hodgman campaigned for a majority government and he won the right to lead the state with an overwhelming majority. Now the constituents expect him to deliver on those expectations to engender hope and confidence back into a brittle and raw community. The new government’s main aim is to focus on enabling job creation in the state. This includes the introduction of legislation to extend a payroll-tax rebate for new job positions until the end of the next financial year. Under the legislation, medium to large businesses will be eligible for the rebate for hiring additional employees by July 1 next year and keeping them on until at least the end of the 2015-16 financial year. TCCI chief executive officer Michael Bailey said he was pleased to see the new government getting to work so quickly on honouring important election promises for the Tasmanian business community. ‘‘It’s great to see progress being made to stabilise the state’s economy through the payroll-tax extension as well as the extension of the first home builders’ grant,’’ he said. ‘‘These initiatives will help encourage investment and boost employment prospects, with the payroll tax rebate aiming to create 600 new jobs. 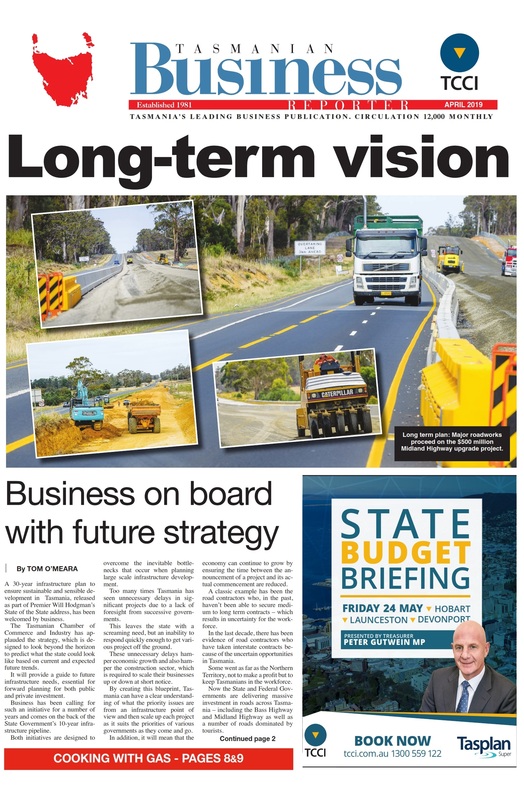 ‘‘The government is certainly off to a promising start, but there is still a lot of work to be done to get the Tasmanian economy moving,’’ Mr Bailey said. ‘‘Now is the chance for the government to follow through on its commitment to developing a long-term plan to restore confidence. Mr Bailey said TCCI members and the business community were looking for leadership and consistency from the government. ‘‘They expect the government to make the tough decisions then hold the line during political pressure and unrealistic expectations from minority groups,’’ he said. Parliament will sit again on May 27.